My friend T came over a couple of weeks ago to help me figure out what to do with the front yard. I was filling Greg in on her ideas and we got to talking about the backyard. He asked me if I'd want to hear what he'd do back there. He then proceeded to spew a bunch of awesomeness. 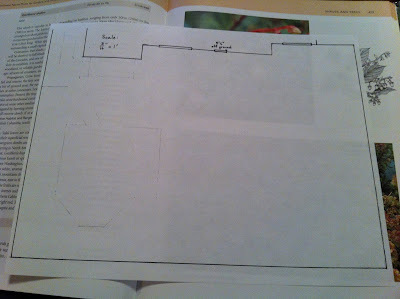 Despite the fact that he hates gardening and has zero interest in landscaping, and the fact that I've never really articulated what I want in a yard, he came up with a plan that nailed everything I want. It's a good thing he's so cute because that's frankly kind of annoying. I think about my yard constantly! Why am I not coming up with this stuff? It would be big enough for a table that can seat 8-10 so I could have dinner parties back here. He'd shorten the existing rotten wood deck off of my bedroom so it was really just stairs, then put down large stone pavers. He'd build up the plantings between the two decks so I'd have a little seating area just outside our bedroom sliders. Think Adirondack chairs and martinis. The big bone planter would get dismantled and moved to the other side of the yard where the cement slab is (and it would have a new shape). The cement slab would get broken up and removed so we could expand the plantings in that weird back corner. 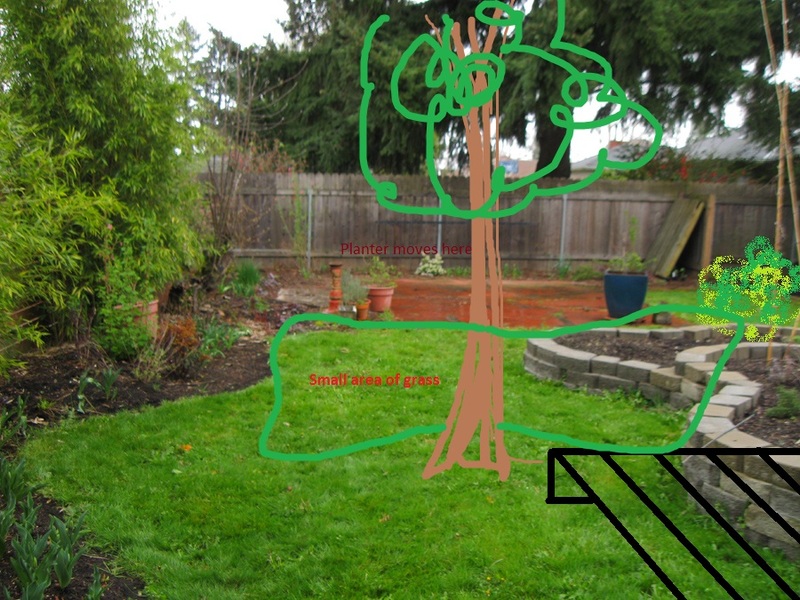 My one addition to this plan was to add a tree in the center of the yard for height and to provide a tiny bit of shade to one side of the deck. And I added a rain garden. 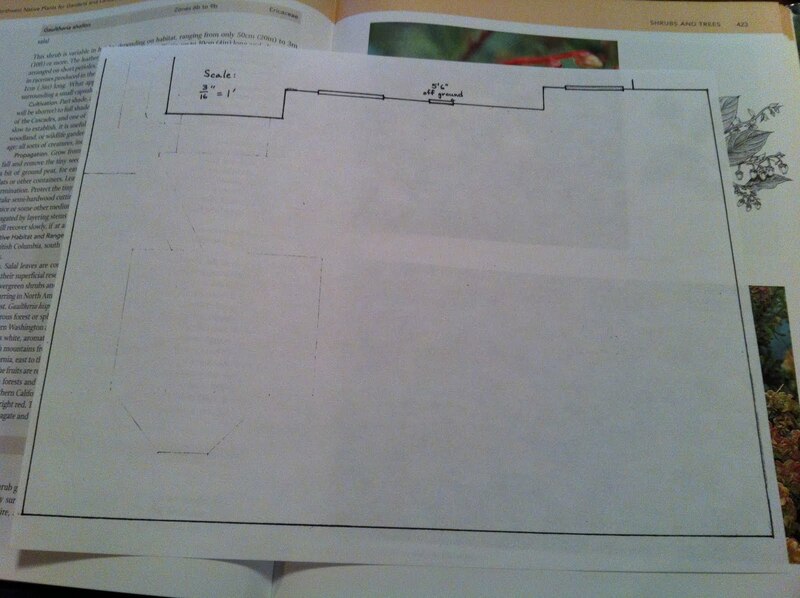 And of course I mocked up these awesome plans in Paint. Of course, he had to outdo that too. 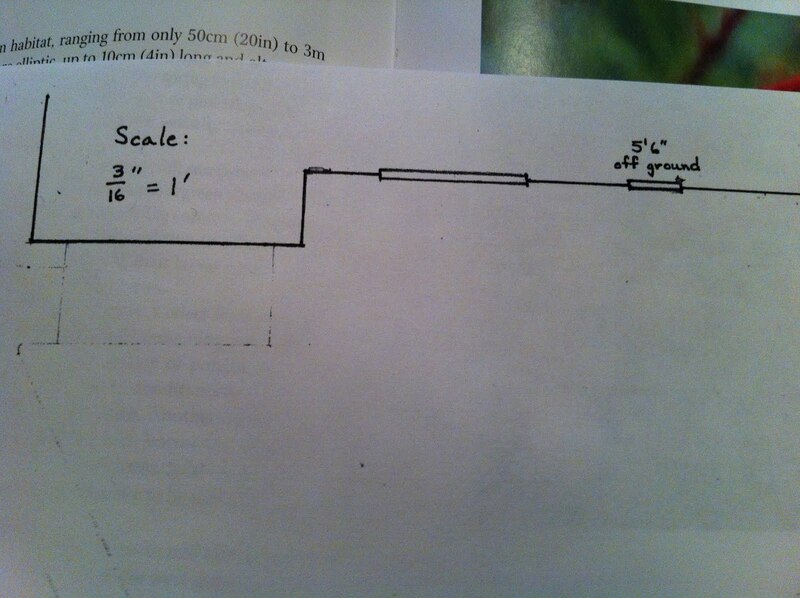 While I was out drinking wine with Bill, Greg measured the yard and built me a layout TO SCALE. So instead of doing everything back there haphazardly, I can PLAN. And give the shrubs the right amount of space and whatnot. Mock-ups will be coming shortly--if we can pull off what we're thinking, we will have the coolest yard in the city. 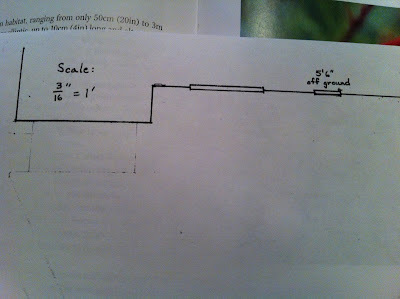 Of course, this could all be an elaborate plan to eliminate the lawn so he doesn't have to mow it. I conned him into doing it every week if he doesn't have to do dishes. Sucker. Your backyard is going to be the 2nd awesomest in the city. Holy crap, this is awesome. Will you rent him out for consultations? Sounds like an excellent plan for the backyard (and a closet landscaper). You'll have to pretend to drink wine with your friend more often. Can't wait to see the final results! Do you have any idea what a "treasure" you have? 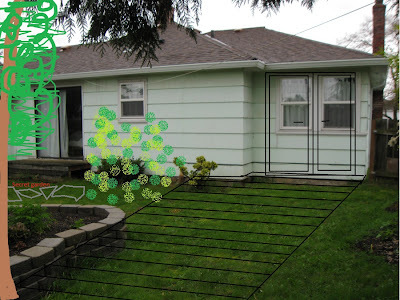 My hubby never comes up with some really gorgeous ideas, how we could improve our landscaping. Ok, he does the actual work once we planned and worked out something together and he helps me keeping up on the garden but other than that, his priorities are set for fishing. Now I can't wait to see the posts coming here on your blog about the progress of your project. You got quite a bit of a job ahead of you. Looks cool! My dream is to someday have french doors off of a master bedroom... I'm not sure why. I guess I picture myself strolling out there in the morning in my robe with a cup of tea like a rich person. My fiance does all that planning stuff too- he's a whiz with Illustrator. Lucky us! @Amy - Do I smell a throw down? Dueling barbecues . . . GO! @Anne - How much are you willing to pay? ;) I charge top dollar. @PJ - I know I got lucky. I'm very thankful to have found somebody so awesome. A backyard to scale map?!?! Now he's just showing off.